The challenge always begins with an outdated kitchen. Picture this, or rather rewind. Where to? An era far, far from 2017: one in which linoleum flooring and small enclosed spaces were considered okay. That's exactly what these newfangled pilgrims embarked upon when they made their eastern journey from Minnesota, MN to Wellesley, MA. But, alas! a serendipitous event followed. For, Divine Design + Build's intuitive designer (some might say even genius) Jana Neudel was there to save these homeowners day. So, From pasé to oh hey, Jana manages to reinterpret the whole of the first floor. While the bones of this mid-century colonial beamed of well-designed promise, a ceremonious approach from closed to open-floor plans were just the beginning. Dark and dingy reproduces itself into bright and sunny. A miracle is born. The process in transforming this Wellesley colonial begins. First, understanding this particular family's needs and dynamics. For starters, two young boys, and a new baby on board, creates a building block to begin: this space must be fun, quirky, and energetic to meld with future homework assignments at the kitchen counter, or Sunday morning omelettes plus green eggs and ham. It was evident to Jana Neudel that this was to be more than a kitchen, this was to be the center of life. Oh wait, did we mention there is a dog too? And, when one reaches this conclusion, one must realize that the only way this growing family's memories can fit into said central meeting place, is to open that kitchen up, up, up. Thus, the construction begins. To maximize on the home's potential, Jana along with her clients decided to move the whole kitchen into the preexisting dining room. Effectively, the kitchen sink moved from the house's back wall to it's front wall. Along with all other elemental parts to a working kitchen. 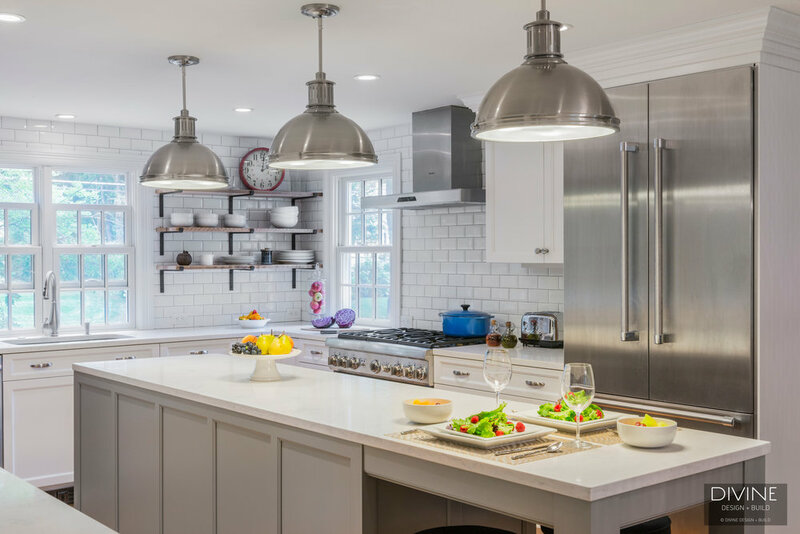 In the process of this "switch over", the designer recommended eliminating the poorly laid out walls and narrow, short hallways on the both sides of the former kitchen and dining room. Once these unnecessary nooks and cranny's came down, what was left was the breath of a flowing open space. Subsequently, square footage revealed itself once out from under the cloak of bulky, closed-floor-plan concepts. 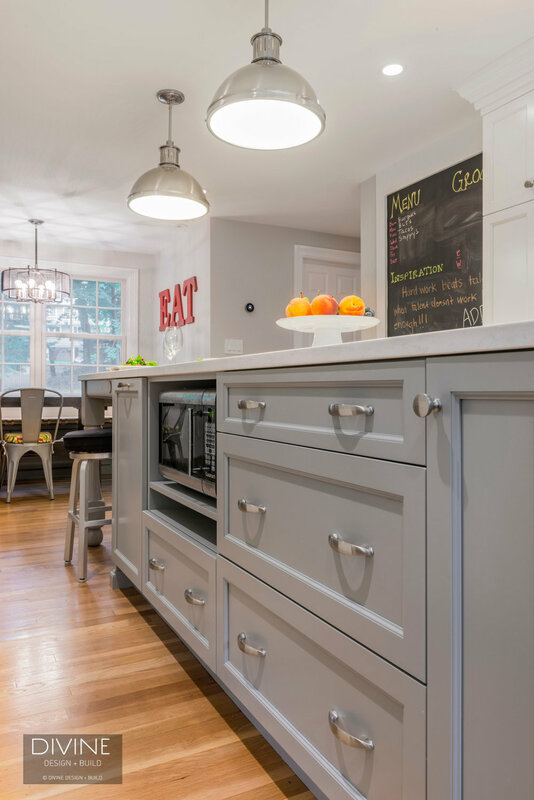 DDB designer Jana and her clients were now able to actualize their eclectic dream of mixed kitchen and dining perfection. And, of course, what would perfection be if a VIP dog nook wasn't integrated somewhere as well. Hey, we all need somewhere that feels like gastronomic home--- dogs too. The end result? A refreshing take on the American transitional kitchen. Shaker style cabinets from Holiday Kitchens Cabinetry are paired with not-so traditional shelves supported by black, steel wall brackets from Rejuvenation. A reconnaissance between old and new is formed. Similarly, Jana and her clients played with the juxtaposition of old and new elements throughout the whole space--- enter the incorporation of industrial pendant lights, and an avant-garde dining room chandelier from Seagull, Elk and Walker Lighting manufacturers. The incorporation of these utilitarian styles play off of the delicate marbling found on the kitchen's counter-tops. The contrast of hard and soft translates seamlessly with MSI's Engineered Quartz counter tops in Calacatta Vicenza. The result is breathtaking, yet subtle in it's placement. Kind of like the sillites outlets discreetly found on the kitchen side of the kitchen island. Ooh la la. 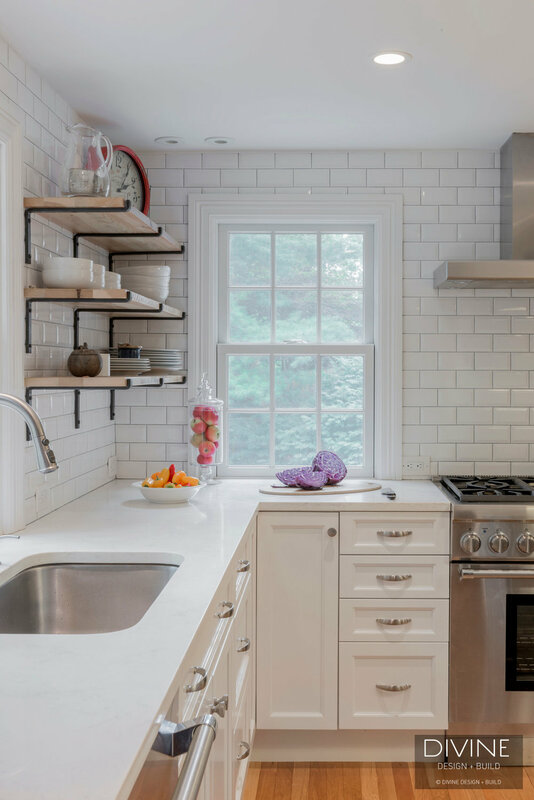 Again, Jana of Divine Design + Build hi-light an ease in character with their quirky take on subway tiles. 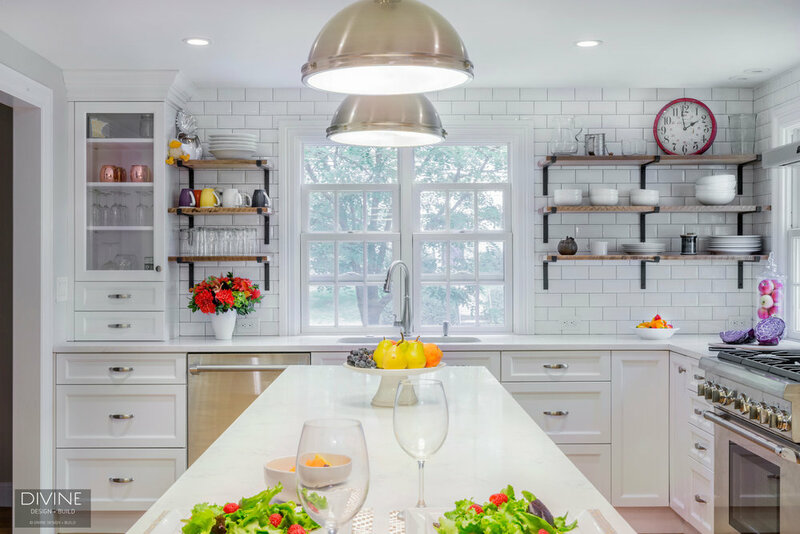 While subway tile back splashes are a recurring theme throughout the transitional American kitchen, this home deconstructs the tiles' previous conceptions. Beveled subway tiles from SOHO Tile paired with an unexpected gray grout sets this back splash design far above the rest. While the nod to subway tiles' history is apparent, the shine from the beveling, and the contrast from the grout implements delectable eye candy for those who bear witness. Stainless finished appliances, i.e. gas range, range hood, refrigerator and etc. from Thermador, pair with similarly finished Kohler faucets/accessories and an under-mounted Houzer sink. The pristine, clean details from the appliances again work with and in contrast to the intricate details found in the space's hardwood flooring. New and old + sleek and intricate form this kitchen's eclectic essence: a transfusion of hypothetical references culminate into one timeless bubble. Functionality is found in the making of lifelong memories for this growing family.